Joey sat up straight. Vic had trailed off right in the middle of his story. Vic, who had lit a cigarette at some point, snuffed out his smoke and got another from his pocket. Why didn’t he just get on with it? Joey wanted to yell at him. There were four empty beer cans on the table. Joey had been so engrossed he hadn’t even noticed when these had appeared. Despite Vic sounding like a bad Star Trek episode, Joey wanted to hear more. Vic moved slowly as he took a drag off his cigarette and blew a plume of smoke into the air. Vic leaned in close to Joey. The smell of tobacco and beer was strong on his breath. He pointed at Joey with the cigarette and his eyes closed. Victor? This guy knows my name? The old guy was running, his robes wafting out behind him. A glace over his shoulder and Vic could see the two figures he thought were people hunkered down and gaining on them with frightening speed. He ran harder. “Did your mother send you, Victor?” the man asked between gasping breaths. Vic, as best he could while running at full speed, looked at the man’s eyes. The deep, steely blue was his father’s, but this man was old. Very old. His dad had only been gone for a few years and he wasn’t that old to begin with. They crested a small dune and Vic pulled his father to the ground. Vic poked his head up. The beasts he saw with their dog heads and, how many? four arms, were nearly upon them. These things were going to tear them apart with nothing more than a thought. Vic took up a handful of sand. It was all they had. That and their clothes. Well, it worked in all the westerns. Right? One of the beasts flew over the dune and spun around, teeth bared and ready to strike. Its four arms were massively muscled and it flexed and let out a hoarse scream. Vic fumbled for a handful of sand and was not able to get a handful. He had to do something. Anything. He wasn’t just going to sit here and die. The beast cocked its head. Had it understood? The second beast came over the dune and crashed into the first. They barked and growled at each other, then their attention was back on Vic. He blinked several times to make sure he wasn’t just imagining all this. The beasts exchanged glances. One looked back and nodded for Vic to go on. One of them snarled. Well to Vic it made sense. The beasts were shaking their heads. One of the beasts nodded and pointed to the right. The side of the arena neared and Vic could see the low wall. The spectators, with their wriggling tentacles, looked as if they were cheering. The two beasts were coming up from behind and coming up quickly once again. There were no guards in the immediate vicinity of where they were planning to run. Hector cleared the low wall without breaking stride. Vic wasn’t nearly as graceful. His foot caught the top of the wall and he fell onto the stairs. The seats near where he fell were now vacant and more clearing as the two beasts pounded up the sand to the wall. The first leapt and appeared to be taking chase of Hector. These two were good at this. They looked really convincing. Four hands grabbed Vic and he was hefted into the air. The second beast held Vic aloft and shook him and howled. If there was any moment when the plan could have gone horribly wrong, this was it. Hadn’t the stupid creature understood? They weren’t really supposed to fight, just run. The creatures nearby cringed away. They were scared of the sound the dog thing made. Vic screamed as if he was being torn apart. They pressed away even further. The beast slung Vic over one shoulder and pounded up the steps after the others. It wasn’t stupid. It was putting on a show. It wanted everyone to think this was all part of the killing. The steps and subsequent passageway were empty. They sped down the passageway and Vic could hear his father scream. That’s what was helping clear the way. After several twists and turns they were outside. For the first time Vic got a glimpse of the sun. It was distant and dark. Barely more than a blue ball in the sky. The two beasts were now carrying Vic and his dad. They ran as if they knew where they were headed, growling and barking all the way down the cobbled streets and any of the tentacle creatures that the encountered quickly moved aside. Apparently his idea of making a lot of noise was what they needed to do. The squat buildings all looked the same, but there was something in the way that they ran and turned that Vic knew everything was going to be alright. Suddenly it didn’t matter that his dad was really old, he was here and he was back together with him. He was going to be able to talk to his dad. They could zip around space and even go back to Earth and get mom. This was the best. A building larger than all other buildings came into view. There was a sign upon it, but Vic couldn’t make out what it said. “Argmon,” it grunted and ran on. Well, at least he knew this things name now. Didn’t know what good that would do, but it was something. The first beast had stopped at the entrance to the building and was in the process of wrestling with the door. The second, Argmon, joined in and they tore the door off its hinges. All four ran inside. The building was one massive room inside. It was filled with spaceships. Vic had seen enough movies that he knew what a spaceship looked like and these were even better than anything he’d expected. If the two beasts were also prisoners, this must be some type of impound yard or something like that. The first beast pointed to Argmon and a ship. It was a huge ship. Next to it was a similar ship, but smaller. Vic wanted to stop and look all around, but the first beast and his father had already run into the smaller ship and Argmon was almost at the larger ship. Vic rushed to catch up. A shower of sparks descended down upon him. He hadn’t heard anything, but when he looked back, four tentacled beasts were aiming weapons and preparing to fire. They even had silent weapons. That was weird. How’d they manage that? All thoughts of silent weapons were put out of his mind when the second shot came a little too close. He followed Argmon up a small ladder into the ship. When he was nearly at the top, Argmon reached down and pulled him inside and slammed the door closed with a resounding clang. It was so nice to have sound back. Vic had though he was going to go insane from all the silence and quiet. Argmon wasted no such time with contemplation. Instead he pounded along the passageway. Vic tried to keep up, but kept stopping to look at everything he passed. He didn’t want to miss anything. Argmon turned and growled to get him to go faster. Vic complied. They stopped in the cockpit that would become very familiar to Vic over the years. He strapped in and Argmon launched the ship through the roof of the impound building. Out the view port just behind them the smaller ship followed. They were getting away. This was great. Vic felt alive and vitalized. This was the best time of his life. He and his dad were going to be renegades on the run! His father was alive. What an incredible feeling. A bright flash of light off the side of the ship blinded Vic for a moment. When his vision cleared he could see debris of the smaller ship drifting back down toward the planet. 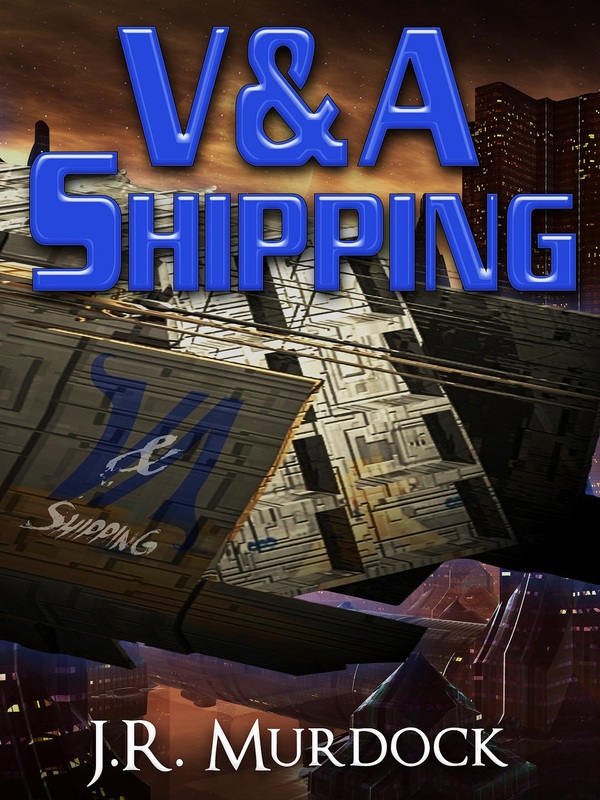 Posted on February 9, 2013, in V&A Shipping and tagged chapter, read along, v&A shipping. Bookmark the permalink. Leave a comment.